Make sure to attend our Tuesday, February 3 meeting to hear guest speaker, Liz Pidgeon reveal details about the story of the top secret crash of the Woomera CA-4 bomber at Bylands in January 1943. We hope you find it a refreshing update; easier to navigate and quickly find newly added featured content. The site now also has the ability to easily share content with your friends via the social media connectivity buttons and the capability of providing feedback and comments. 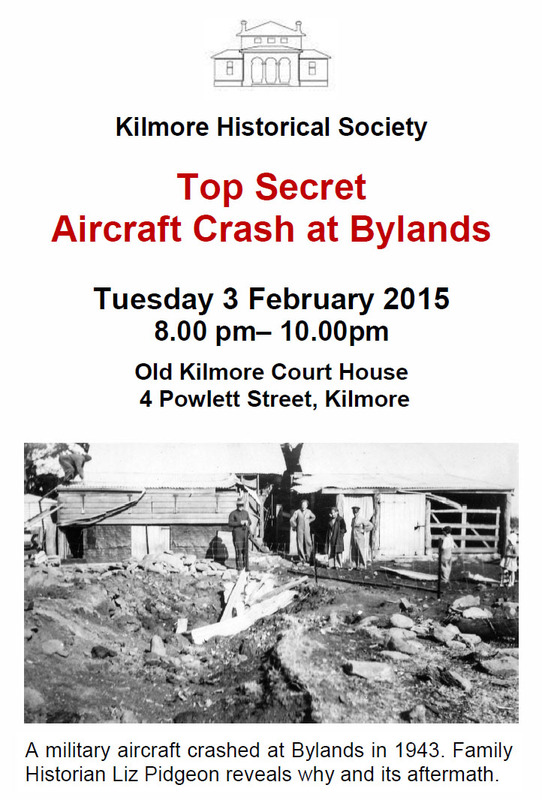 We hope that you will feel free to share your own Kilmore related stories with us. As part of our makeover we have also integrated the Kilmore Footsteps page previously hosted by one of our members on their own personal site. Researchers may submit their ancestors’ births, deaths and marriages data and contact details for connecting directly with other researchers and family connections. Kilmore Historical Society does not necessarily hold any records on these families and this page is offered purely as a service to the community. However, research inquiries to the society are most welcome as well as your stories about your Kilmore ancestors.